In fall 2014, Goshen College launched a new all-campus band to provide a fresh musical outlet for GC students regardless of their major. The band is an inclusive, non-auditioned ensemble and performs in concert as well as select athletic and other campus events. 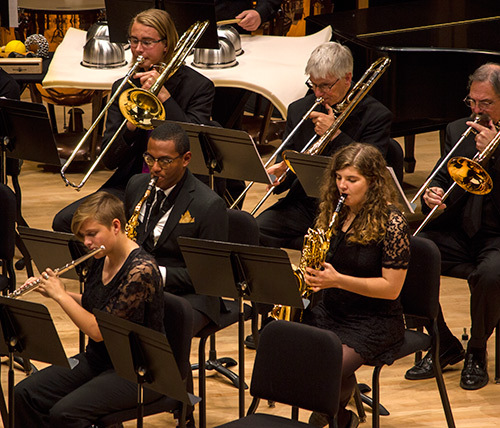 Drawing on the region’s strong high school band culture, the GC Wind Symphony provides new opportunities for wind, brass and percussion musicians. 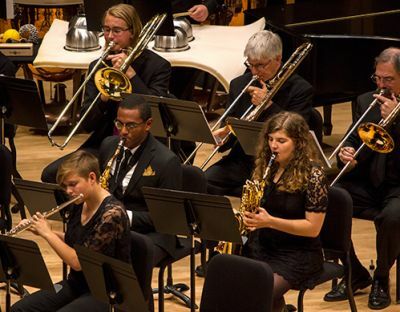 The ensemble is also open to Goshen College faculty and staff wind, brass and percussion players. Jose Rocha brings 16 years of experience in public music education, most recently serving as director of orchestras and chamber music at Johnston Middle School for the Performing and Visual Arts in Houston (Tex.). His musical training began in Monterrey, Mexico where he was student and later faculty of the Youth Orchestra of Monterrey, a program inspired by El Sistema. His bachelor and master of music degrees are from the University of Florida. He completed a Doctor of Musical Arts degree in cello performance with a minor in music education from the University of Houston.